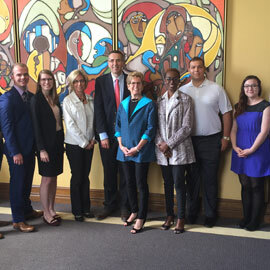 Students from Wilfrid Laurier University’s Master in Applied Politics program visited Queen’s Park June 7 as part of the program’s “Practical Politics” workshop series. This final workshop was aimed at building students’ understanding of legislative and political strategy. Students attended question period and met with Ontario Premier Kathleen Wynne as well as the Deputy Leader of the Conservative Party and the Liberal and New Democratic Party (NDP) house leaders. Daiene Vernile, MPP for Kitchener Centre and a Laurier graduate, also chatted with the students about the political process. Students spoke to the premier about how she sees her role in terms of cooperation with the opposition parties and achieving her legislative agenda. They also spoke with the house leaders about how each of them approaches the legislative process and how they work with members of the other political parties. This is the first year of the Master in Applied Politics program. The 12-month program incorporates a Certificate of Practical Politics for students who complete four of six workshops offered through the academic year. Workshops are organized by John Milloy, Laurier’s practitioner-in-residence, and have included: Evidence-Based Policy-Making; Advocating to Government; Employment as Political Staffer/Public Servant; Crisis Management; Media Relations; and Election Campaign Strategy.